Bruce asserts that the 37% level means these people tend to be "price seekers" (looking for cheaper broadband offers like telco DSL) rather than "alternative video seekers" (i.e. those who prefer OTT video to pay-TV). The LRG data roughly aligns with another recent study, by Altman Vilandrie, which found less than 5% of consumers watch OTT video instead of pay-TV. Bruce didn't break out further detail this year, but for the same study 2 years ago, he found that just 5% of the broadband/no pay-TV group said the main reason for doing so was because they can watch all the video they want online, whereas 28% said it was because of cost, 26% because they don't watch much TV and 18% because they don't have a need for TV service. There are real-world implications to the question of how big the broadband-only size of the market is. Think about HBO. There's no other TV network that has been called on as much to make its programming available outside of the pay-TV ecosystem than HBO, partly due to the popularity of its shows, but also due to its superb HBO GO mobile app. Still, HBO's explanation hasn't stopped many from suggesting HBO could have far more subscribers if it went direct. For example, just last week Netflix's CFO said that if HBO went direct it would have materially more subscribers. Of course, keep in mind that whenever you hear a company comment on its competitor's business there's almost always an ulterior motive. In this case, because Netflix wants its OWN pay-TV deals (as it's started to make in Europe), it would dearly love to see HBO go direct, as it would help bolster Netflix's case with U.S. pay-TV operators that direct and wholesale relationships can co-exist. Meanwhile, it's not just HBO that the broadband-only market size question applies to, but all cable networks and video content providers. 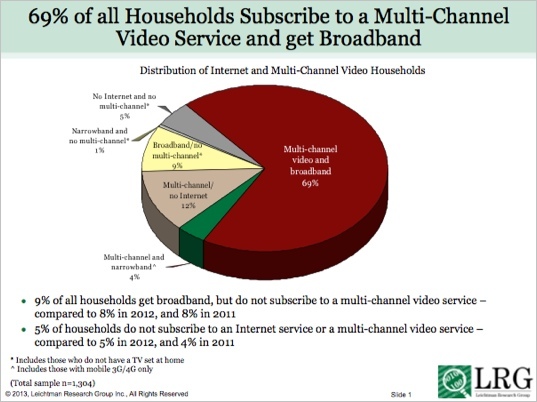 Today broadband and pay-TV are standard for many; as LRG points out, 69% of U.S. homes subscribe to both. And OTT services like Netflix and Hulu have positioned themselves as complementing, not substituting, for pay-TV. With broadband-only homes still relatively small, this dynamic should remain. But if broadband-only homes were to grow quickly, then all cable networks and content providers would have to reassess their business models. For now though, despite all of the talk about cord-cutters and cord-nevers, broadband-only homes seem to be a relatively small part of the market, which for the most part aren't driven by OTT but by cost and needs. Whether this changes remains to be seen.